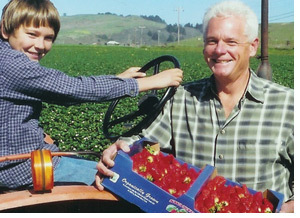 After years of pioneering organic production methods for strawberries, Swanton Berry Farm founder Jim Cochran turned his attention to the farm labor question, becoming the first organic grower in the country to sign a contract with the United Farm Workers union in 1998. In doing so, Cochran led the way on an issue that is often sidelined in sustainable food circles, namely the wages and working conditions of the primarily immigrant workers who tend and harvest our crops. Since then, Swanton Berry Farm has also become a pioneer in the US-based movement for domestic fair trade. When Cochran started the farm in 1983, no one had grown strawberries organically on a commercially successful basis; the industry meme was that it couldn’t be done. Pesticide purveyors even offered to come and fumigate his fields for free. But Jim was determined to give it a try. Having worked in farmworker-owned cooperatives in Central California, he had seen the harmful effects of pesticide use firsthand. So he got a small loan, leased a few acres of land and started to experiment. At that time there was little help available from the industry, which was actively blocking studies on non-chemical alternatives to Methyl Bromide. Historically used as a soil fumigant in conventional agriculture, Methyl Bromide was identified as a potent neurotoxin that also contributes to ozone depletion and was subsequently banned for use in agriculture. While large conventional strawberry growers lobbied for approval of an even more toxic replacement, Methyl Iodide, Swanton Berry Farm continued to remind people that non-chemical alternatives are possible. Swanton’s farming process is much more complex (and slower) than in the conventional system where chemicals are injected into the soil before planting and insecticides are sprayed according to a proscribed schedule as the plants mature and bear fruit. Instead, we work to build healthy soil by rotating strawberries with other crops, in particular Brassicas like broccoli and brussels sprouts, as well as cover crops like mustard. We also leave some land in dry fallow, conserving water and allowing the land to rest before being returned to strawberry production. Finally, we don’t push the plants too hard by over-fertilizing and over-watering and we choose varieties that have lower yields but better flavor. In the early days it wasn’t clear that this approach would be commercially successful. It took five years for the farm to turn a profit. This gradually changed, and many other growers have followed suit — Swanton has moved from supplying 100% of the organic strawberry market production to now only 1%. However the secret to the farm’s success lies not simply in organic certification, but also in growing high quality fruits and vegetables that taste good and are produced under fair labor conditions. Believing that it was “wrong to pay so much attention to the soil and not the workers,” Cochran decided to look beyond the USDA’s organic certification for additional guidelines. Around this time, the United Farm Workers union was busy trying to organize strawberry farms thirty miles to the south, in the Pajaro Valley. For Cochran, this became an opportunity to open a dialogue with the union and the Swanton workforce. Just as they had with organics, other strawberry farmers warned him it would kill the business. Now, more than ten years after Swanton workers voted to unionize in 1998, the farm is flourishing. However, unlike with the organic practices Swanton pioneered, few other strawberry farms have followed suit. Many people assume that unions are needed only where working conditions are so bad that workers need protection and that the owner-union relationship is necessarily conflictual. Historically, farmers have been especially good at engaging ideas of agricultural exceptionalism to fend off organizing in the industry: that somehow the nature of agicultural work was such that farmworkers should be denied the most basic right to organize. Today’s farmers, even most organic ones, are no exception. Part of the reason Swanton unionized was to show that a constructive relationship was possible. The union contract recognizes the dignity of farm labor, formalizes the farm’s commitment to fair labor practices, and provides an arena for workers to have a voice in the workplace. Through the union Swanton workers have a medical and pension plan. Negotiated every three years, the contract also delineates vacation and holiday pay, seniority and grievance policies, and a more recently introduced Employee Stock Ownership Plan (ESOP), the first of its kind for a farming operation. Since 2005, workers have received shares in the company based on their annual earnings and years on the job. The shares are valued based on an outside evaluation of company performance. The goal is to offer long-term workers the opportunity to have a stake in the company and to realize an additional benefit upon retirement. Administration of the plan is not without its challenges. It has taken time for individual workers’ accounts to grow to the point of being financially meaningful. It also takes seven years for workers to become eligible to receive the full value of their accounts. Even so, it’s an exciting challenge to traditional ownership models in agriculture, which are deeply tied in to the family farm ideal. While the Swanton Berry Farm model has required significant risk-taking in a highly competitive and supremely conservative industry, it has also proved successful. From four acres in 1983, the farm has grown into a 200-acre operation growing strawberries, cane berries, and vegetable varieties suitable to the cool, foggy climate of California’s Central Coast. Annual sales have reached $2 million and profits have been positive for most years, averaging about 3%. Customers can find Swanton produce in farmers’ markets, independent natural food stores, and Whole Foods markets in the greater Bay Area. Every year, thousands of people visit our farm to learn about organic strawberry farming, pick their own berries and sample our farm made jams and bakery treats. Swanton has also been involved in two major projects to develop social standards for US agriculture. The first in 2003, the Social Accountability in Sustainable Agriculture Project, included a team of international social and organic certifiers. In 2006, the second pilot turned into an ongoing collaboration with the Agricultural Justice Project (AJP), a certification system based on the experiences and involvement of food and farming operation owners and workers alike. As a member of the Domestic Fair Trade Association, Swanton works to raise awareness about the connections between ecological sustainability and worker justice. Despite over five years of work to promote the concept of domestic fair trade, Swanton Berry Farm has yet to become certified. Just as it took many years for organic agriculture to catch on, it has taken time for the concept of social certification to gain traction. As usual, consumers are ahead of farmers. Even a quick scan of the food blogs suggests that consumers and activists increasingly understand that “knowing where our food comes from” entails attention, not only to the farmer and the land, but to the wages and working conditions of the agricultural workforce. That’s why Swanton is working with other farms in the area and with our organic certifier, CCOF, to bring domestic fair trade certification to California.